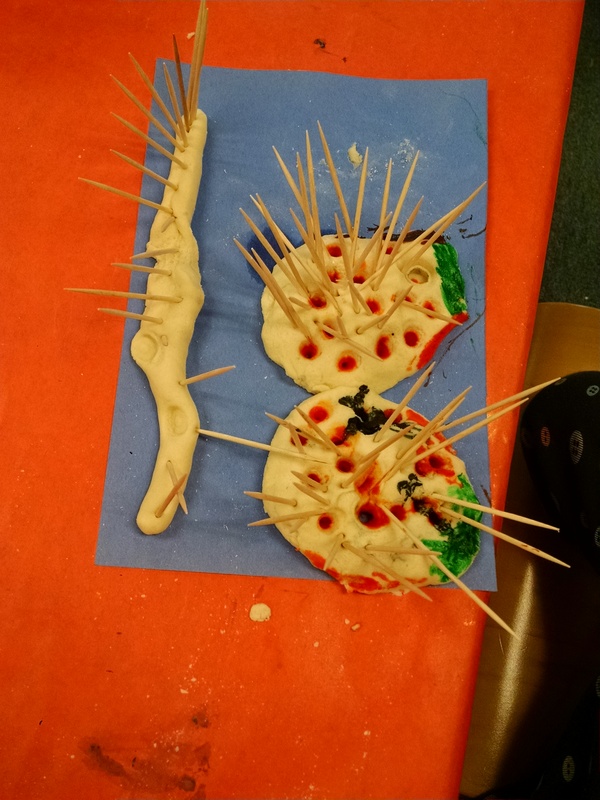 We have done this topic as a stand-alone unit near Halloween, and also combined it with Bugs (and Exoskeletons) and with a unit on the Human Body. Key concepts: The skeleton creates a structure for our body. 1) Having long, strong bones helps us to stand up and to carry things. 2) Our skull and ribcage help to protect our fragile organs. 3) Our joints allow us flexibility. So, in this post, I’ll first share our activities with you, then at the end, I’ll talk about how we discuss these concepts during opening circle and closing circle. Build a Cardboard (Or Straws) Finger or Hand. Here’s a post describing this in a detailed tutorial. Build an elbow joint. You can also make a paper or cardboard arm to show the lever action of the elbow joint, as seen in our Levers class. 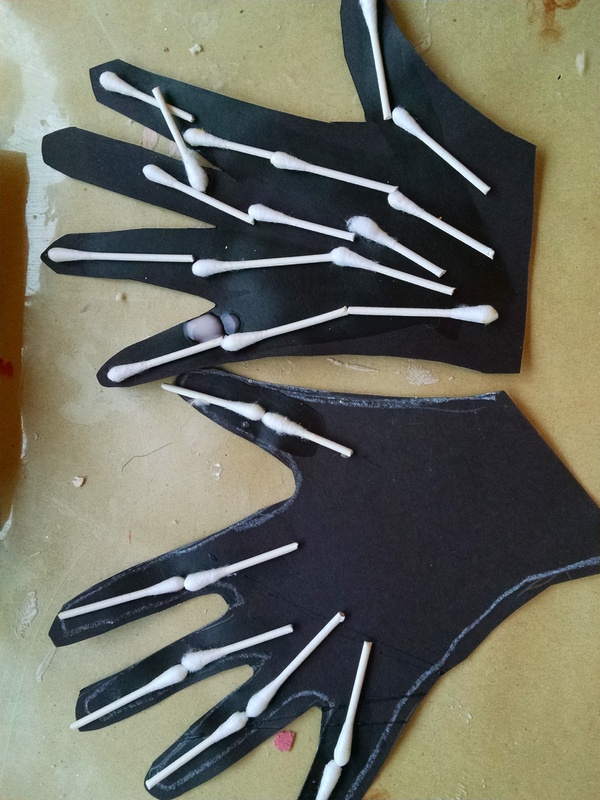 Hand x-rays: We had black paper hands, Q-tips we’d cut into halves (or straws cut short), and glue. Children glued on bones. 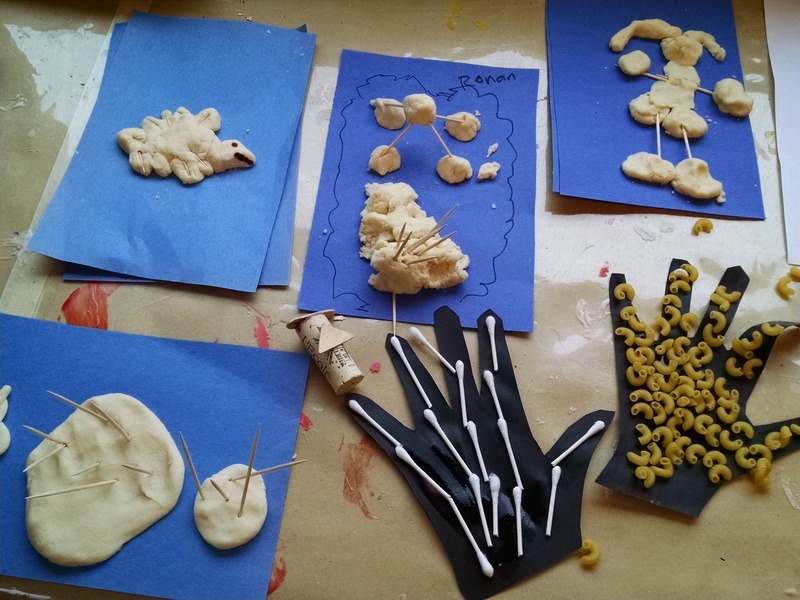 Make a sample for kids to copy, but also have an x-ray of a hand so children really see what they are creating. 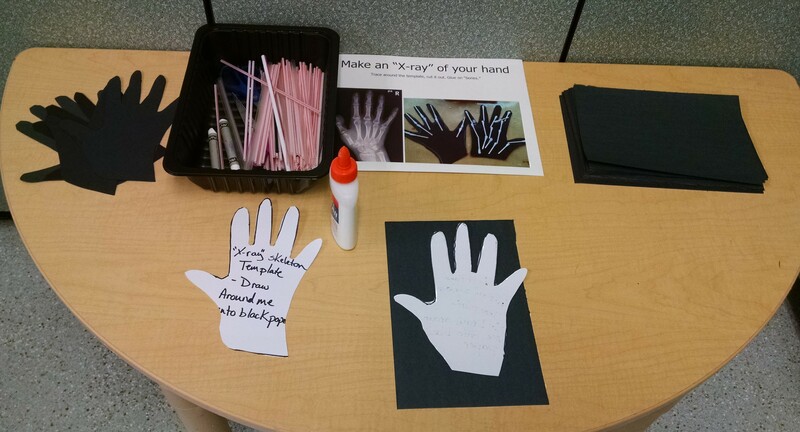 Almost Unschoolers has a fun idea of helping the children feel where the bones are on their hands, then painting their hands where they can feel the bones, then pressing their hand onto the black paper, making a handprint of their bones that looks a lot like an x-ray. 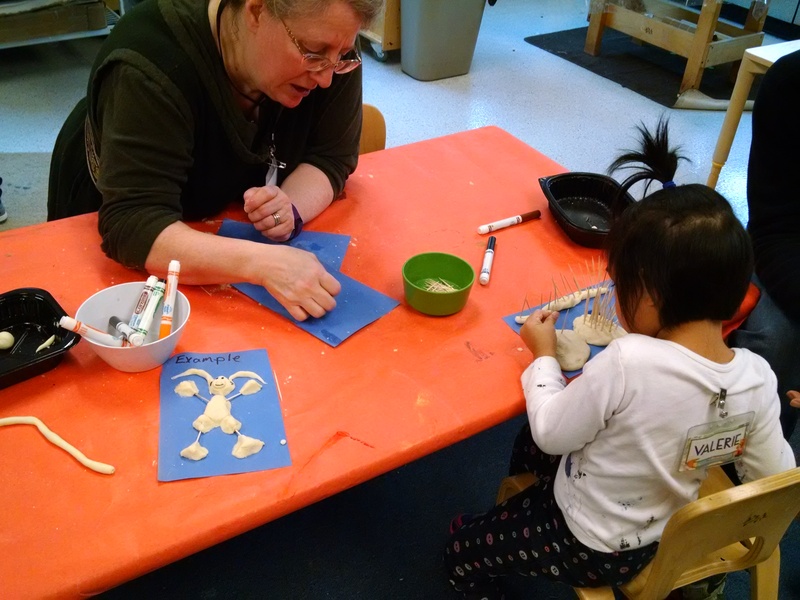 Build skeletons to support a salt dough body: The idea was: Using salt dough and toothpicks (you could also use wooden coffee stirrers cut short), build a skeleton, then build the body on top of it. 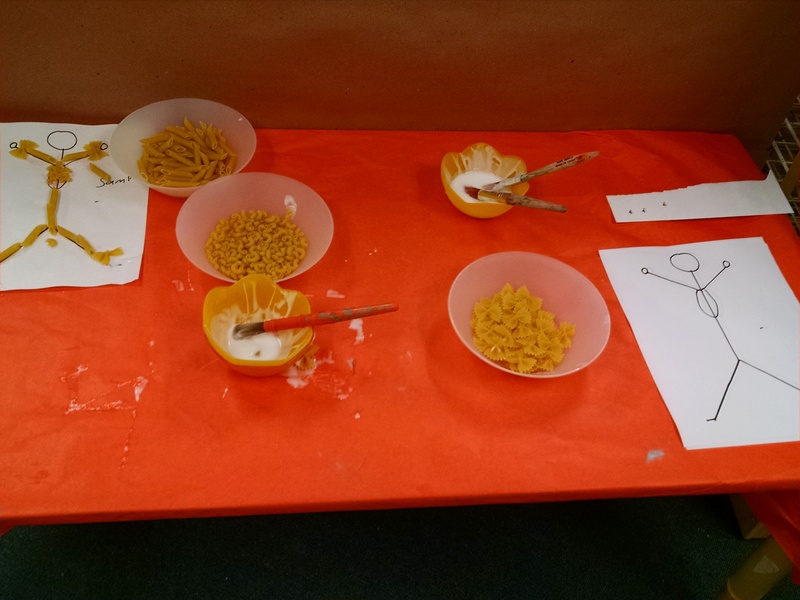 Children used the materials in a wide variety of ways, none were quite what we’d expected / planned. Would be worth trying again with a sturdier building material for the skeletal structure and a lighter weight substance to coat it with. Skeleton puzzle: We printed the skeleton found here: www.gamescraftscoloring.com/crafts/halloween_skeleton.htm then laminated it and cut it apart. Children could assemble it on the floor. 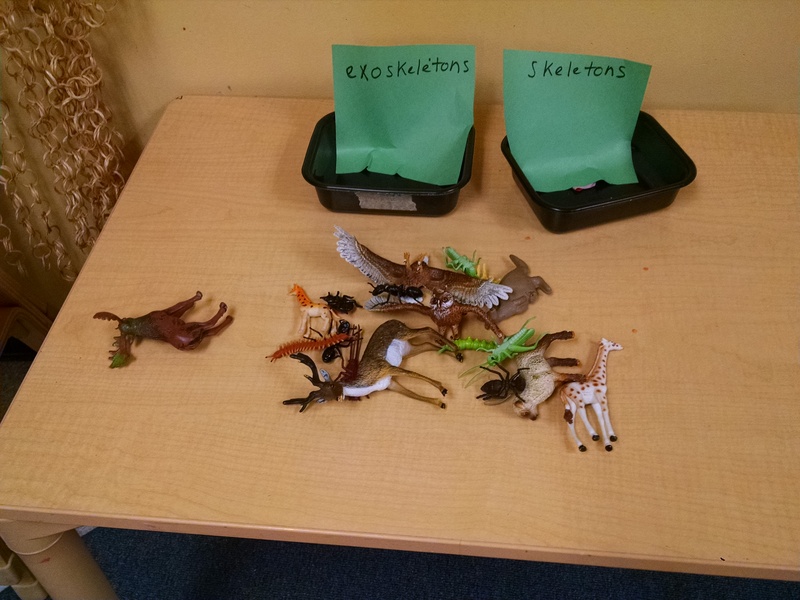 Sorting: We put out two dishes labeled skeleton and exoskeleton, and a collection of plastic animals and insects and had the children sort them. Science experiment: We considered trying to dissolve chicken bones in Coca-Cola (search online for more discussion of this, or just look at one kids’ experiment: http://schools.dcsd.k12.nv.us/zces/kixmiller/class/dkixmiller/%602012/www/a/Gabriela/ScienceFair.htm. But, we were concerned about health issues of raw chicken bones. In class, we knew we wouldn’t see the full effects in a couple hours of class, but wanted to introduce the idea, so we had egg shells, vinegar, and pipettes and eye droppers. The kids placed eggshells in a cup and dripped vinegar on them. In the morning class, the vinegar fizzed all around the eggshells, so you could see a reaction happening. For some strange reason, in the afternoon class, we got no reaction at all… But the kids still enjoyed playing with pipettes and eye droppers. A note about Zoob: I have to say that if I was buying construction toys for home and had limited space and budget, Zoob would not be my first choice construction toy, as I find they’ve got some big limitations on what you can do with them. But, if your child already has lots of experience with other building toys, these offer an intriguing new set of challenges. Skelly the Skeleton Girl by Jimmy Pickering. Fiction, age 4 – 6. If you like the art style / humor of Nightmare Before Christmas and Coraline, you would like this book. Some might find it a little creepy. Tells the story of a girl who finds a bone and asks all her monsters if it’s theirs, then discovers it belongs to a skeleton dog. The Skeletal System by Kay Manolis and Your Skeletal System Works! by Flora Brett are both good non-fiction with good images – for ages 7 – 9 Skeletal System by Sarah Tieck would be better for 6 year olds. Skippyjon Jones and the Big Bones by Judy Schachner. Here’s the Amazon review. “Holy guacamole! Skippyjon Jones is crazy-loco for dinosaurs! The kitty boy enters (via his closet) the land of dinosaurs in search of the fabled Skipposaurus. Instead he runs into his old amigos, the Chimichango gang. When a T-Mex threatens the pack, it’s El Skippito, the great sword fighter, to the rescue. With yips and yowls, he drives the big baddie away, so all the dino-dudes can rattle their bones another day.” Kids like it because it’s kind of wild and crazy. I don’t like it. My co-teacher feels like there are racial stereotypes some people may find offensive. 2) Our skull and rib cage help to protect our fragile organs. What are bones? 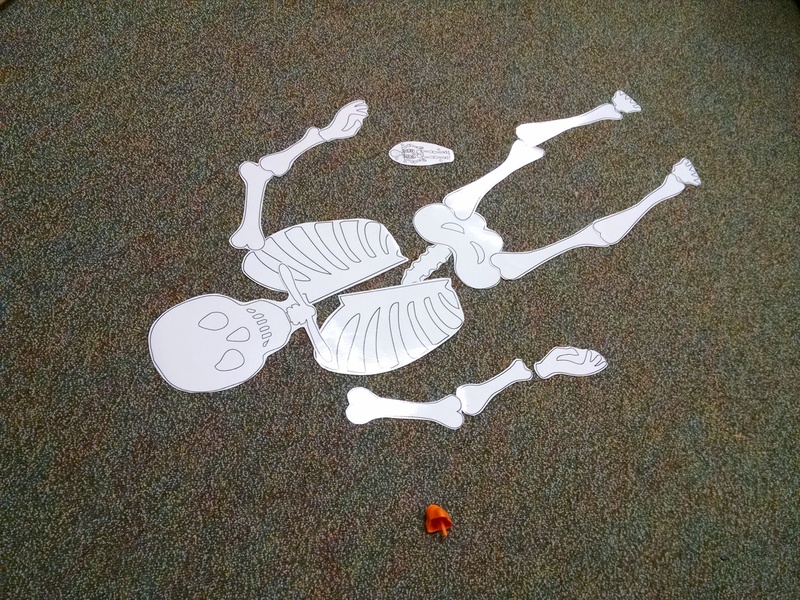 Especially for our little ones (age 2.5 – 4) we needed to ground them in what bones are and what a skeleton is. (I asked during little kids’ circle: “who here has a skeleton?” and one child raised her hand.) You can have them touch their cheek and feel how soft it is, then touch their jawbone or cheekbone and ask them to notice how hard it is. (If you have a skull model or picture of a skull, point out these bones.) Then have them feel their arms or hands and notice more bones. Why are bones helpful – they help us stand and carry things. Talk about it, but also show it. One way to demo concept # 1 is to fill one glove with water or flour, and another glove with a “bony” hand made of popsicle sticks, and with water or flour. (As shown in this post on Pink and Green Mama.) 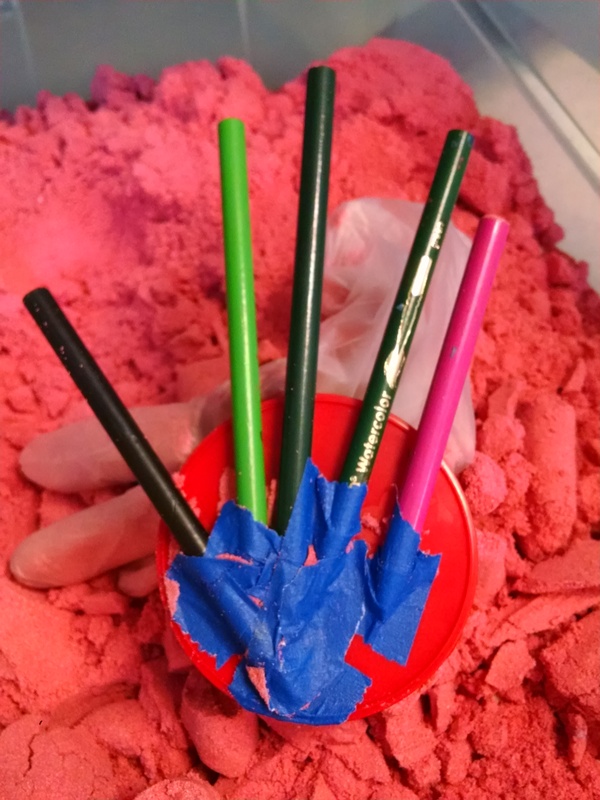 I made our bony hand with a jar lid and five short colored pencils taped on, then tucked in a glove filled with kinetic sand. They can explore how floppy and useless the boneless hand is, then feel how sturdy the hand with “bones” is. Have them try holding a small book (or a wooden block) with the floppy fingers – the book falls to the ground. Then hold it with the firm fingers. How do bones protect us? You can talk about how the rib cage protects the heart and lungs, and the skull protects the brain (concept #2). We didn’t cover this specifically, but I bet you could do something with inflated balloons as the lungs. Have them blow air into a balloon (like the balloon is taking a deep breath). Easy, right? But what if you were out working, and something heavy fell on your chest? (Now lay a hand on the empty balloon, squishing it flat, and ask them to blow it up again. (Have the balloon take a breath.) It can’t inflate. Then protect the balloon inside a box or something to represent the rib cage. Now put the hand on the box… the box stays firm, the balloon isn’t squished… you can blow it up. 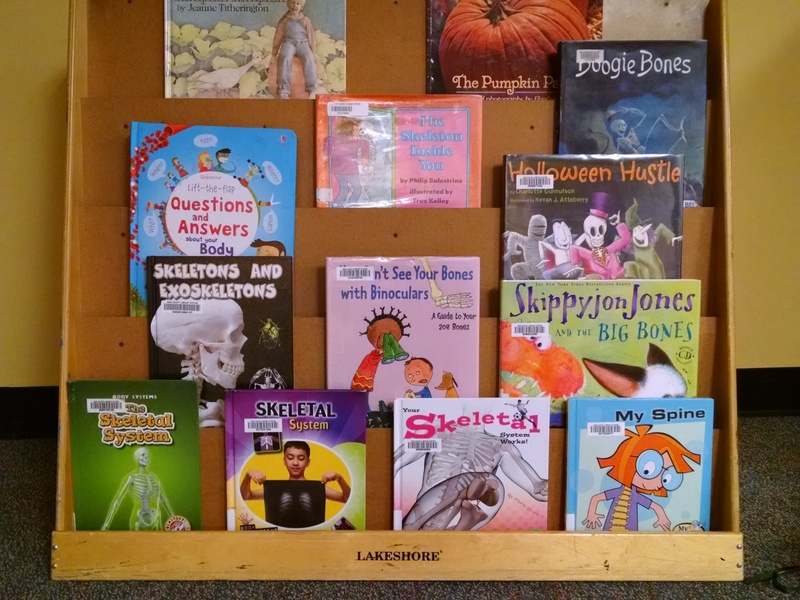 We first talked about all the things we had discovered and explored about bones and skeletons during discovery time, opening circle, and tinkering time. Then we added a new concept: joints. How do joints help us? Go back to your hand made of pencils and sand/flour. It can hold up a book or a block. But, can it pick up a small object (like a cheerio)? No, because it has no joints. 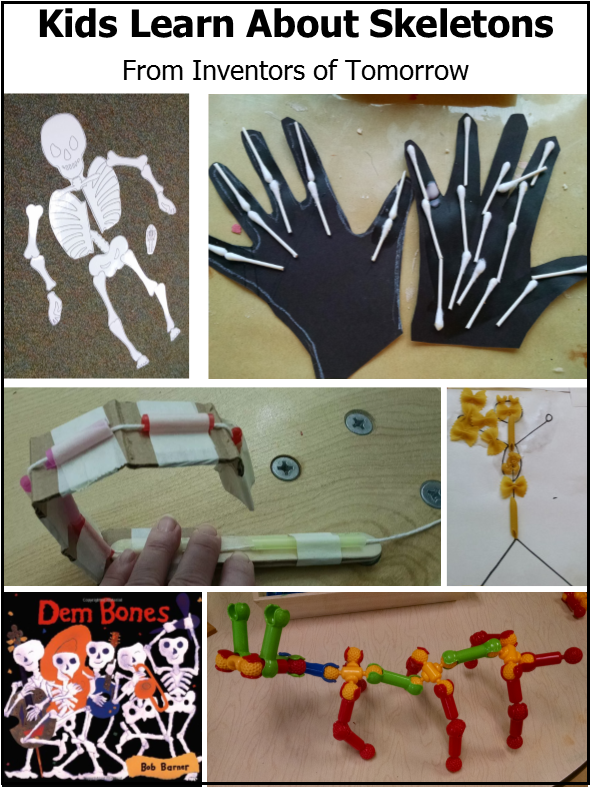 To help them further understand why joints matter, take long poster tubes or wrapping paper tubes, and slide them over the child’s arm (as shown in this post on Growing Little Scientists, which also has LOTS of other great ideas about teaching bones and joints). This locks their elbow joint straight. Now have them try to scratch their head. If you’ve already talked about simple machines, and did the activity showing how the arm is a lever, you might remind them of that. 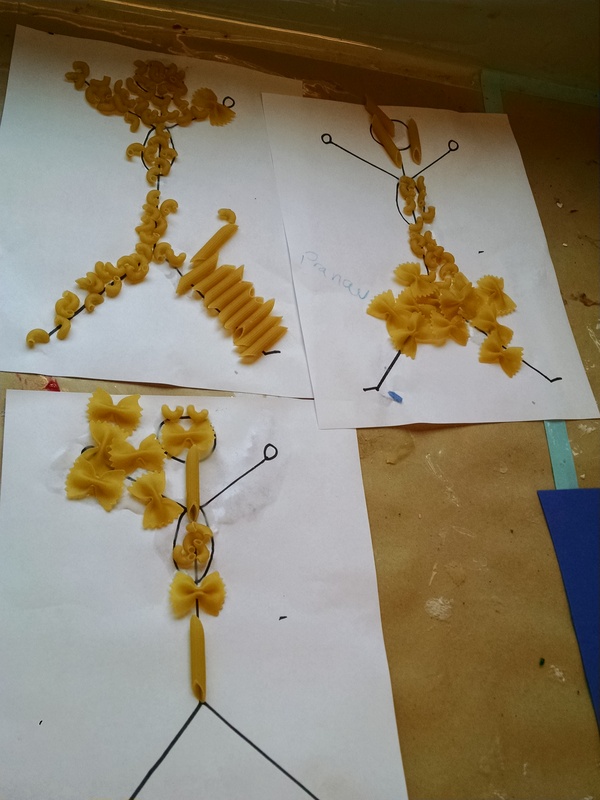 We had several wooden artists’ manikins, so we passed them around for kids to explore. I encouraged them to notice: how does the manikin’s elbow bend? Is this like your elbow? How does its shoulder move? Is this like your shoulder? 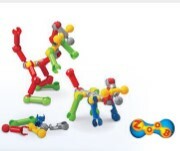 Is it like the Zoob toys we played with? Then I posed a manikin and asked them to do the same thing with their body that the manikin was doing (lift one arm up, put both hands forward). 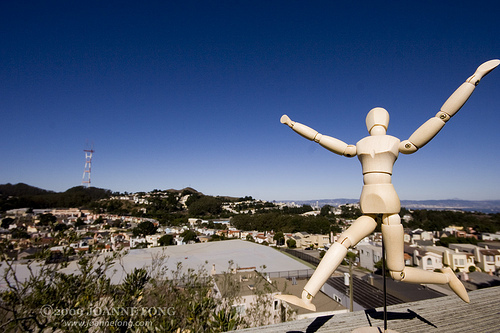 Then we did it the other way… I did a motion and asked them to copy it with the manikin. 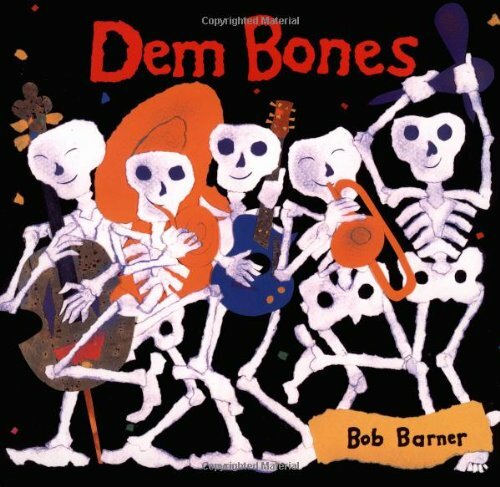 We then sang Dry Bones as a fun wrap-up to the day.